Today we covered Ether 8 through 11. That is a lot of material, and after coming off yesterday’s Convoluted Pathways activity, I especially did not want to gloss over the convoluted choices of these descendents of Jared and the others (who had come over in the barges). The ability to apply spiritual teachings and scriptural perspectives to modern-day application is something seminary students are just learning how to do. Thus, I try to always point to some modern day example that matches the ancient example given in the scriptures. The kids explored that – problems with honesty, etc. Thus the question: why would students have a problem with honesty? The proposed easy gain from cheating. Then I held up yesterday’s paper mentioning a museum who had made millions of dollars by breaking the law. They had shown an exhibit the state had ordered them not to exhibit. They flaunted the order, showed the exhibit anyways and as a result, made a load of money. Why did the museum flaunt authority? Could it have been for gain? Then I shared a story from the news yesterday about how gangs are quickly thriving in America. We read Elder Hales’ quote on page 262 in the teacher’s manual. We read Elder Ballard’s quote on the same page. We read Ether 8:23-25 on the secret combinations which would exist in our day. Moroni truly saw our day! I asked which nations already have been destroyed by secret combinations? Why do secret combinations appeal to so many people? What happens to people that they can stomach activities which hurt others? How do they justify it? Why? This is a pressing issue, especially because of the warning in “The Proclamation on the Family”, from the First Presidency. We read an excerpt in class today (found on page 266 in the teacher’s manual), where the First Presidency prophetically warns about the potential destruction of modern societies. “Can you see the connection with the quick decline of the Jaredite people and our society today?” I asked. In preparation for our chapter research, I asked the class: how do you get from being childlike in youth, yet eventually get to where you cheat in college or where you flaunt a state order (as adults running a museum) or where you join a gang and hurt other people? What are the underlying and motivating factors? And how carefully do we need to watch ourselves, so that we don’t fall prey? I drew three dots on the board – spread apart from each other in a straight line. The first dot represented a childlike state of “purity”. The next dot represented “flaunting authority. The final dot represented the kinds of activities “secret combinations” engage in. I promised the students that as they searched the scriptures daily, it in essence restores their ability to see clearly and makes them better able to see through the craftiness of Satan and those who would deceive the students, who would try to lead them slowly to the next dot on a parallel descent to depravity. In final prep for our research in today’s chapters, I said: “If we’re not reading our scriptures every day, how come?” The list came quickly… too busy, too tired, don’t like it, too hard, I forgot, etc. Well, Moroni saw our day (as did other prophets). It’s why he included what he did. I shared with the kids, “The book of Ether doesn’t exist just to tell the story. Throughout Ether, Moroni is editorializing, teaching, imploring us to ‘get the picture! '” I let the class know there were urgent reasons he shared the convoluted pathways of the Jaredites with us. write a summary for each verse from their chapter on the paper (this was important and ensured they were familiar with the many twists and turns listed in their chapter). Once that was completed, they were to focus on the Coat of Arms questions/activity sheet I’d distributed. Once they started on the Coat of Arms activity, the students were to consider and answer the questions I’d listed for each section on the Coat of Arms. We talked about how a Coat of Arms symbolizes the protection the warriors in ancient battles received from their shields. I told the students Moroni wanted them to have the same protection today and was trying to get that message across in the historical story he was telling them in their chapter. We had done a Coat of Arms experience before, where I’d let them design their own Coat of Arms. But this time, I had a very structured idea in mind with very specific questions I wanted answered (to see questions, click on picture up above). So I utilized an idea I’d seen (from my husband’s “My Goals Worksheet” received from Brother and Sister Kouri from the LDS Employment Center) with specific questions written out by each section. (To be able to read the questions, click on the picture above. Or better yet, you can download this for free at the Seminary Class Notes group. 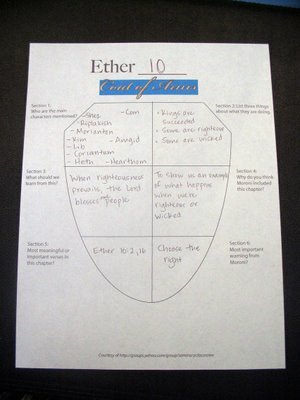 The students worked on their Coat of Arms (for an example, see the top of this blog entry) and tomorrow they will be presenting what they learned from the Jaredites. I’m excited to hear their perspectives.